Federal and local authorities worked together to bust a major drug ring that used fake Uber vehicles to deliver drugs to dozens of people in the Bronx and Manhattan, law enforcement sources told News 4 New York. Michael George reports. Federal and local authorities worked together to bust a major drug ring that used fake Uber vehicles to deliver drugs to dozens of people in the Bronx and Manhattan, law enforcement sources told News 4 New York. The alleged ring leader of the operation, 34-year-old Alfredo Tejada-Almonte, and five of his alleged accomplices have been arrested in the past week, with five of them nabbed Tuesday morning, the sources said. The group faces federal drug charges. Authorities have named six people suspected of taking part in the drug ring, including alleged leader, 34-year-old Alfredo Tejada-Almonte. As part of the operation, the six suspects placed fake Uber logos and stickers on vehicles to fit into the neighborhoods and not raise suspicions, according to sources. Heroin and cocaine were sold to more than 100 customers in upper Manhattan and the Bronx, the sources said. The dealers weren't drivers for Uber and it appears they didn't use the Uber app, but they did utilize the company's logo to disguise their vehicles while making deliveries, sources said. Uber said in a statement Wednesday that "misrepresenting an affiliation with a company to commit a crime is not acceptable." "We are thankful for law enforcement's efforts to combat these crimes," the statement said. 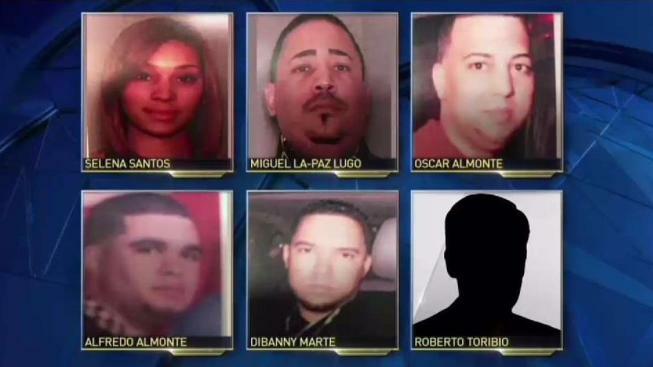 The suspects allegedly stored the drugs at an apartment in Washington Heights, according to sources. Authorities seized one kilogram of cocaine, five vehicles, a kilo press and more than $22,000, according to sources, who said one of the vehicles had a concealed compartment inside of it. The DEA, NYPD, New York State Police, Homeland Security and eight other agencies took part in the year-long investigation.